Wear it straight or at a jaunty angle, this purple straw top hat is perfect for picnics, races and other fancy summer events. Hand-blocked in royal purple parasisal straw over wood hat blocks. The crown is adorned with a periwinkle blue cockade, ribbon and veiling. 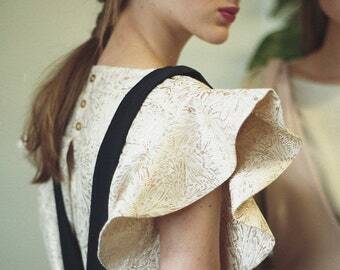 Gray and white ostrich feathers complete the dressy look. Brim is wired and bound in matching purple grosgrain ribbon. Unlined inside. Finished with a grosgrain head-size ribbon and a Silverhill Creative Millinery label. Fits a 22" head size (21.75"-22.25") if you want to wear it straight-on. For head sizes 22.25" and larger, this hat looks amazing worn at a tilted angle! This is a one of a kind hat, designed and created exclusively by me for Silverhill Creative Millinery. 100% hand made in my Vermont millinery studio. All hats are made using traditional, couture millinery techniques (i.e. hand-sewn, no glue used ever, etc.). For sneak peeks at hats in progress, follow @SilverhillCreative on Instagram! Hand-beaded blue straw hat. Kentucky Derby hat. 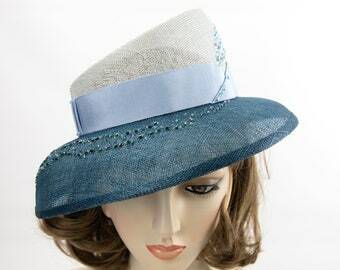 Two-tone sinamay church hat. Women's wide-brim summer hat. Designer millinery. Easter hat. 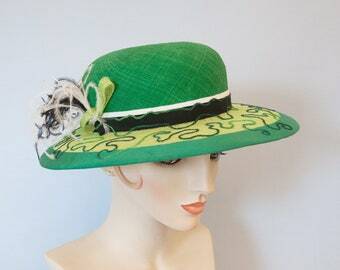 Spring Green Fedora. Wide Brim Women's Hat. Racing Fashion Hat with Ribbon Cockades. Mint Green and Olive Fur Felt Fedora. Ladies Millinery. 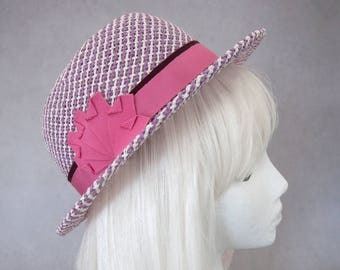 Purple Straw Hat w/ Pink Ribbon. Lavender Porkpie. Women's Summer Pork Pie Hat. Light Purple and White Ladies Fedora. Handmade Millinery. Tan Straw Fedora Hat. Taupe Straw Trilby. 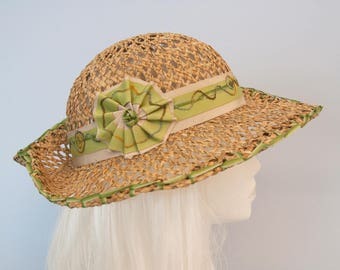 Ladies' Summer Accessory w/ Brown Ribbon. Parasisal Light Women's Fedora. One of a Kind Millinery. Steampunk Top Hat. Brown Fur Felt Hat with Antique Gold Metal Mesh. Hand Beaded Couture Millinery. Bronze Victorian Style Tophat for Women. Green Fedora. Bottle Green Fur Felt Hat w/ Vintage Silk Ribbon Cockade. Ladies' Couture Millinery. Emerald Felt Womens Fedora Hat for Women. The hat was a wonderful gift and Kristin was a delight to work with! Men's Green Fedora. 7 3/8 Fur felt men's hat. Classic menswear. 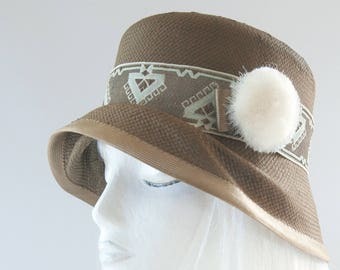 Vintage style handmade hat. Loden green 1940s fedora with removable feather. Kristin, thank you so very much for two more beautifully crafted works of art.❣️ You are wonderful to collaborate with and I do appreciate your gifts. 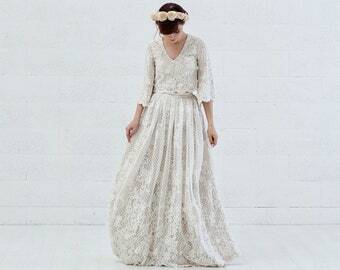 This gat, handcrafted bt the talented owner of Silvethill Creative is stylish and beautiful and looks great with what I am wearing to my sobs' wedding! Thank you. Payment (via PayPal or Etsy direct checkout) is due in full upon order. I am happy to negotiate payment plans for in-stock hats or for custom orders. Please just send me a message. International customers are responsible for paying any duties, taxes or import fees they may be charged. 1. Any items must be returned in brand-new condition. after receiving your package (within 48 hours). 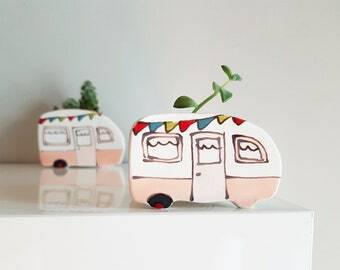 Do this through e-mail or Etsy. The item must then be shipped back within 2 business days after that. 3. I will refund the sale price after I receive the return package. Regretfully, I cannot refund shipping costs unless the fault was mine (i.e. wrong item, etc.). Gift Certificates are not eligible for returns or refunds. Shipping charges too high? Any overages (minus packaging costs) will be automatically REFUNDED to you! Domestic shipping is via USPS Priority Mail (or, on occasion, First Class mail). You will be notified and sent a tracking number as soon as the item ships. If you need signature confirmation, please indicate that in your order notes. If you would like overnight shipping or FedEx or UPS delivery, please contact me before purchase so I can calculate the rates for you. Local customers in Vermont are welcome to arrange for pick-up or drop-off to avoid shipping fees altogether. International orders are sent via USPS First Class International or USPS Priority Mail International. 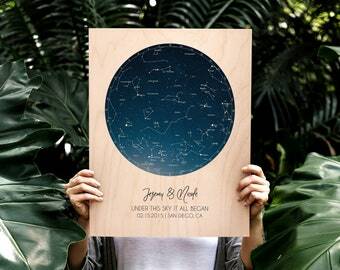 If you want Express USPS shipping or a different carrier (FedEx, UPS, DHL), please contact me before purchase, so I can calculate the rates for you. Note that these can be quite expensive. International customers are responsible for any duties or import fees they may incur (VAT, tariffs, broker's fees, duty, customs fees, etc.) in their country. Please take a moment before ordering to check what you are allowed to import into your own country. Customs can cause delivery delays. Every country is different, and I have no control over whether customs holds, opens or delays packages. Please read each description for appropriate head-size. Most hats are sized for average women's head sizes (21.5"-22.5"); some are one-size-fits-all. To measure your head, wrap a tape measure around the widest part of your head — parallel to the floor, around your forehead, above your ears and around the bump at the back of your skull. In some cases, hats can be resized to fit a smaller or larger head size than listed. Please ask. 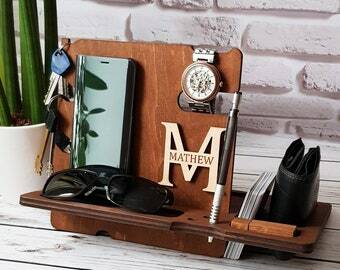 I am happy to create a custom order for you! Delivery time is estimated at 3-4 weeks for custom hats, but it may be shorter. Exact cost and time frame depends on the details of what you want. Please e-mail me at info@silverhillcreative.com if you would like to carry my hats in your bricks and mortar shop. Women's Bowler Hat. 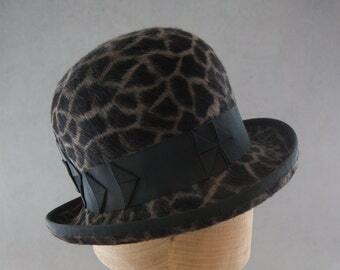 Designer Millinery Giraffe Print Fur Felt Hat. Ladies Derby. Steampunk Bowler. Free Shipping. Animal Print Felt Hat. Lavender Cloche. Asymmetrical 1920s Style Flapper Hat. Vintage Style Millinery w/ Silk Tie Band, Cockade. 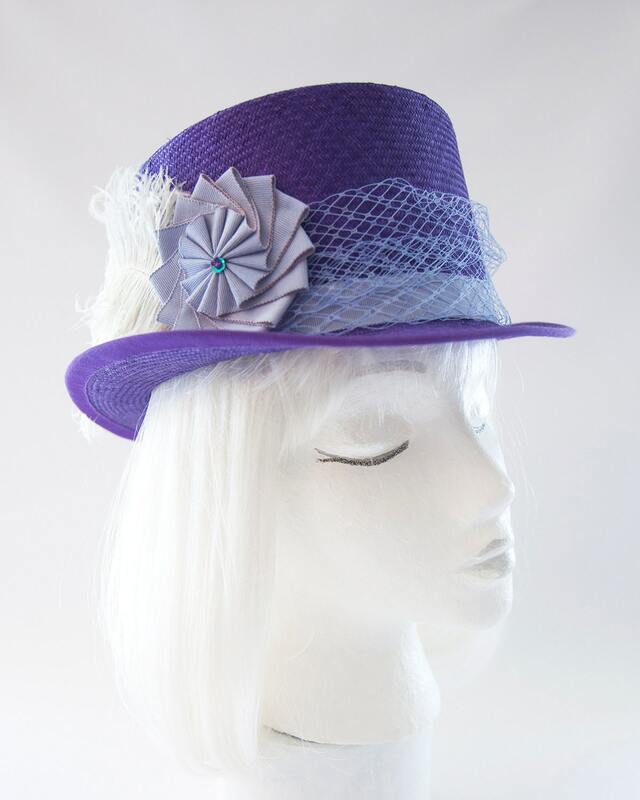 Light Purple Cloche. Fur Felt Hat. Freeform Wool Cloche. 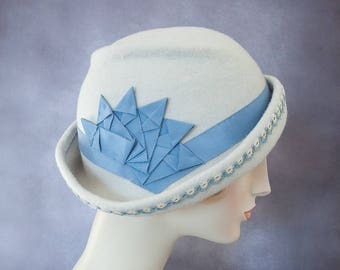 Alabaster Flapper Hat with Blue Ribbon Cockade and Vintage Tatted Trim. Pale Gray Felt Hat. 1920s Style Millinery. 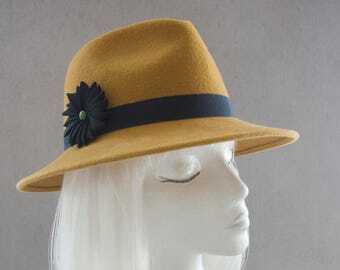 Mustard Yellow Fedora. 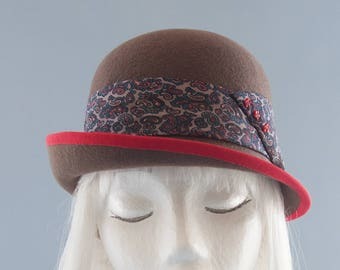 Women's Hat w/ Navy Blue Ribbon Cockade. Wide Brim Velour Fur Felt. Ladies Millinery. Street Style Spring Accessory.